Florence is one of the most popular tourist destinations in Italy. It's a beautiful and historic city that has a lot to offer visitors in the form of history, culture, and art. 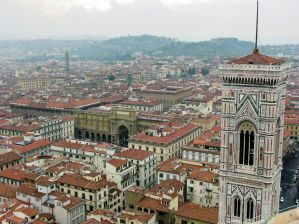 Florence appeals to all types of travelers and there is no shortage of amenities for visitors. 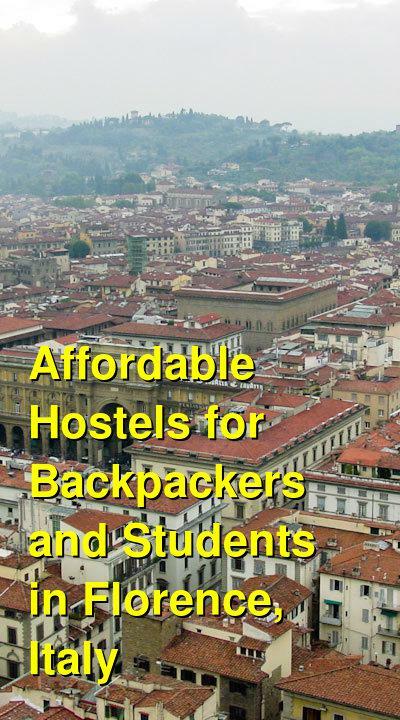 There are many great hostels in Florence, and each have their own style and personality. Some of the most popular hostels in the city are listed below. A fun hostel that is great for backpackers, students, and independent travellers. Hostel Gallo d'Oro is a favorite hostel for budget travelers and backpackers to Florence, Italy. It's a centrally located hostel in Florence's city center and it's just a ten minute walk from the Duomo. It's also a five minute walk from The Accademia Galley and twenty minutes from the train station. The hostel has a fun and energetic staff that can help you with any travel information you might need. They can recommend great restaurants, fun bars, and interesting sights and activities around town. There's also a travel desk on-site where you can organize any tours or ticket purchases. There are tours available to the Chianti area, Siena, and Pisa. The hostel also offers frequent pub crawls and walking tours for guests. There are a variety of amenities available to guests staying here including a delicious breakfast that is served every morning. The breakfast includes fresh fruit juice, fruit salad, bread, homemade cakes, and much more. There are a variety of dorms available that sleep either four or six people. Both female only and co-ed rooms are available. A fun hostel for backpackers and independent travellers. Tasso Hostel is another good hostel in Florence. It's located just a few minutes from the city center and is in an artsy neighborhood with many restaurants, shops, and bars. There's also an interesting nightlife scene nearby. The hostel offers 13 different rooms that each have their own design and style. There are single and double private rooms available as well as two, three, and six bed dorms. There are also several lounge areas, a garden, and a bar where guests can hang out. The hostel regularly promotes local musicians and artists so there is often music you can enjoy and a fun environment. On the weekends, they host parties that can get a bit loud. If you're hoping to get to bed early, this is probably not the best place to stay on a Friday, Saturday, or Sunday. The staff here are travelers themselves and they enjoy chatting with the guests. They can help you with any information you might need and can help you arrange museums tickets, restaurants reservations, or any tours that you're interested in. This is a fun and social hostel where it's easy to meet other travelers from around the world. A popular hostel that is great for backpackers, students, independent travellers, and female travellers. Plus Florence Hostel is one of the most popular hostels in the city. It's conveniently located near many of the city's top sights and it's just a ten minute walk from the main train station. The hostel has all kinds of on-site amenities available for guests including a cafe, bar, and restaurant. There's a nice terrace that offers a great view and there is a travel desk where they can answer any questions you might have or help with any bookings you might need. The hostel has an outdoor pool that is open during the summer months and an indoor pool and sauna during the winter months. There's wi-fi available throughout the facilities as well. The hostel has twin, double, and three bed private rooms available. There are also four, six, and eight bed dorms. Dorm beds come with a reading lamp and a security locker. There are also female only rooms that have a slightly larger bathroom, a vanity table, and a complimentary cosmetic pack. If you're looking for a fun and social place to stay, the Plus Florence Hostel is one of the best options. Whether you're traveling alone or with friends, you're sure to have a great time here.